Christie’s held a 20th Century Decorative Art sale at their King St. location in London on April 20, 2011. A month later Sotheby’s held their 20th Century Decorative Art sale in Paris on May 25, 2011. Both auctions were strong with some exceptional results for certain items. Demetre Chiparus was the star of the Christie’s auction. Lot 109 was a bronze and ivory Exotic Dancer sculpture. It carried a pre-sale estimate of $91,000 – $120,000 and soared to an impressive $315,771, including buyer’s premium. 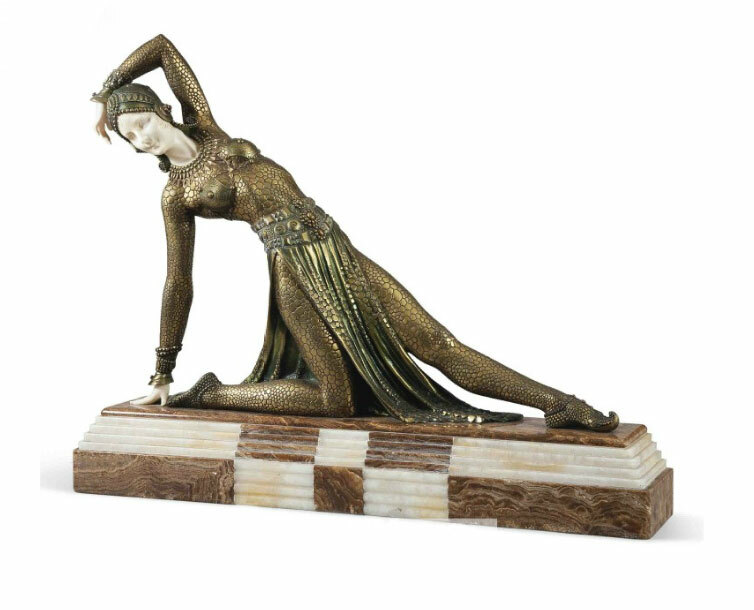 Art Deco bronze and ivory figures by important artists have continued to excel at auction with new auction records established regularly. Another Chiparus sculpture in the same sale, Tanara, sold for $104,004, more than double it’s pre-sale high estimate of $45,000. 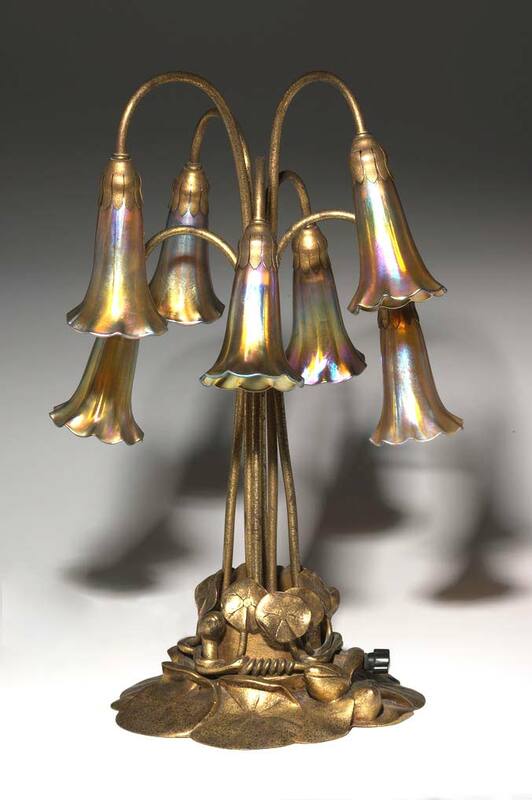 The major auction houses rarely sell items by Tiffany Studios in their European sales, but they do on occasion. Christie’s lot #49 was a rare 28½” diameter chandelier in the Hollyhock pattern. It sold well below its pre-sale estimate of $110,000 – $140,000, realizing $80,475, including buyer’s premium. I think it’s safe to say that the result would likely have been better if it had sold in a New York sale. The stars of the Sotheby’s Paris auction were Emile-Jacques Ruhlmann, the Art Deco master and Antoni Gaudí, the wonderful Spanish Art Nouveau master. 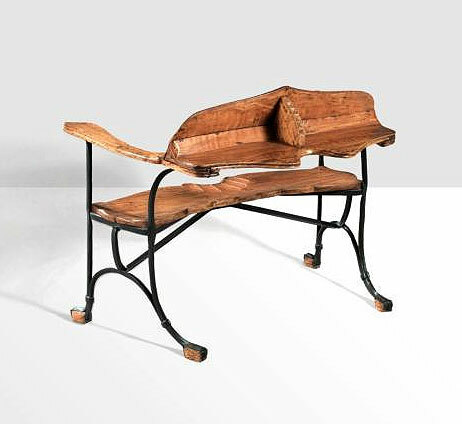 Lot 11 was a carved olive wood and wrought iron two-seat bench. Estimated to sell for between €150,000 and €250,000, it sold for €384,750 ($549,557) – a really nice piece of change. 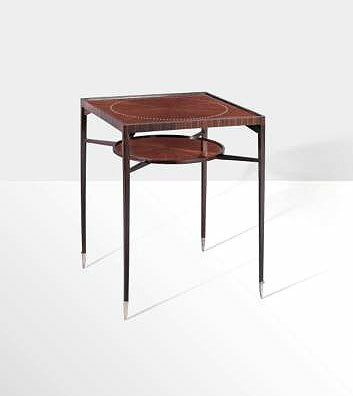 Lot #23 was an Emile-Jacques Ruhlmann Macassar ebony, ivory and silvered bronze table, “Araignée”. It more than tripled its pre-sale high estimate of €120,000 to reach €408,750 ($584,074). I’m sorry, call me ignorant, but I don’t understand it. It’s a very nice table, probably quite rare, but $584,074?? Sotheby’s sale was larger than Christie’s, continuing a recent pattern. Sotheby’s grossed €4,746,950 ($6,782,900), for an average value of $67,829 for each lot sold. Christie’s total sales were £1,797,875 ($2,960,127), for an average of $31,159 for each lot sold. For complete auction results, click on the following links. Sotheby’s results, and Christie’s results. Clarke Auction Gallery of Larchmont, NY, held an auction on May 15, 2011, that likely changed the lives of some of its consignors. Two paintings by New York artist Jasper Cropsey were sold for a total of $822,000. Not bad for two ignored paintings from the wall of the basement rec room. This is the kind of story that shows like Antiques Roadshow thrive on – forgotten items that could easily have been thrown in the garbage but instead turn out to be treasures. Here’s the story in a nutshell – mother dies, children clean up, children go to appraisal clinic, paintings go to auction, children hit the jackpot. The details are what make the story interesting. The two paintings were removed from the mother’s basement wall, where they had hung since the 1920s. Likely, the mother received them as a gift or payment for seamstress work from one of her wealthy Manhattan clients. One of the cleanup helpers offered to purchase the paintings for $125, which was refused. The paintings were then brought to an appraisal clinic set up by the Larchmont Historical Society at Clarke Auction Gallery. Their appraiser didn’t think much of them, deeming them of little value. The auctioneer, Ronan Clarke, intervened, thinking they could be good. He took them to Newington Cropsey Foundation, where one of the paintings, “Prospect Point, Niagara Falls in Winter”, was authenticated with help from a pencil sketch for the painting found at the Museum of Fine Arts in Boston. 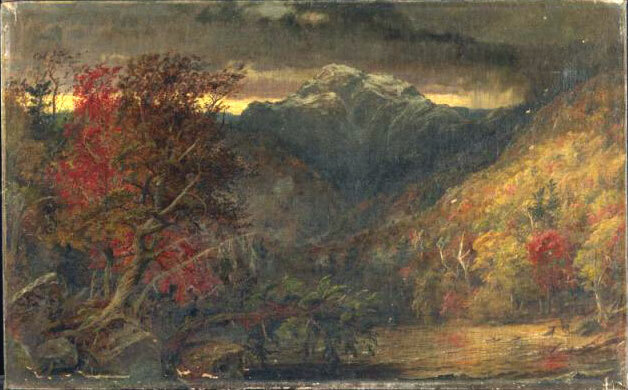 The second painting, “Autumn in America”, was a known Cropsey work that had been missing since the 1860s. “Prospect Point, Niagara Falls in Winter” was the first painting to come to the auction block with the following description. 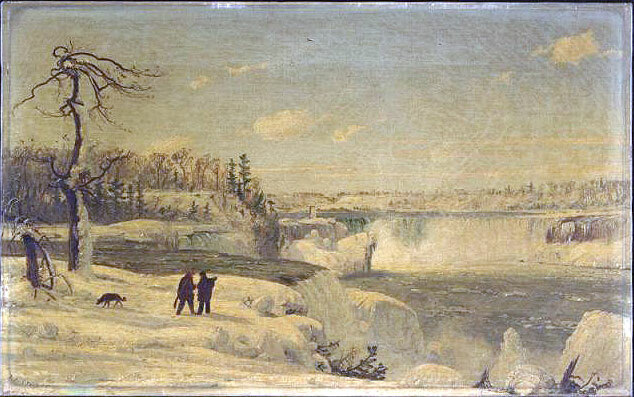 Niagara Falls in Winter.” N.D., after 1856. Signed lower left. As featured in the April 6, 2011 New York Times. Authenticated by the Newington-Cropsey Foundation and to be included in the Cropsey catalog raisonné. 1856 preliminary sketch (see photo) courtesy of the Boston Museum of Fine Art archives. As found in a West Hartford, Connecticut home. Dimensions: 15″ high x 24″ wide. Bidding started at $50,000 and rapidly soared to the final price of $540,500, including buyer’s premium. Although all of the phone lines had bidders, all of the action took place on the floor, with a New Jersey dealer competing against a Connecticut private collector. The collector won. The next lot was “Autumn in America”, described as follows. c. 1860. Signed lower right. From the series of “The Four Seasons.” As featured in the April 6, 2011 New York Times. Authenticated by the Newington-Cropsey Foundation and to be included in the Cropsey catalog raisonné. As found in a West Hartford, Connecticut home. Dimensions: 15″ high x 24″ wide. It also opened at $50,000 and had the same active floor bidders. The final price of $282,000, including buyer’s premium, far exceeded its pre-sale estimate, but not with the same fireworks as the first painting — still a very strong result. This time the NJ dealer was the winner. Kudos to the auctioneer for spotting, authenticating and selling the paintings. Are any two French cameo glass vases identical? Take a look at the photos above. They are each examples of Gallé scenic banjo vases, meant to be the same. If you look carefully, you can see that although the scenes are very similar, they are not identical. The easiest detail to note are the birds in the sky. The vase on the left has two birds, the one in the center, three birds and the one on the right, five birds. Upon very close inspection, there are many small differences in the trees, branches, reflections, etc. The glass artists started with a prototype that was the standard to copy, but were given latitude to make minor changes, as they saw fit. The colors also varied quite a bit, depending on the applied glass layers. The differences in the two vases above are more difficult to spot, but if you spend enough time, you’ll find plenty. (Kind of like the two similar photos side by side in People magazine.) The easiest place to spot differences are in the tips of the leaves. They are more curled in the vase on the right. These vases are another example that shows that no two French cameo vases are identical. Lalique vases can be identical because they were cast from the same mold. French cameo vases were not molded, except for blownout vases. 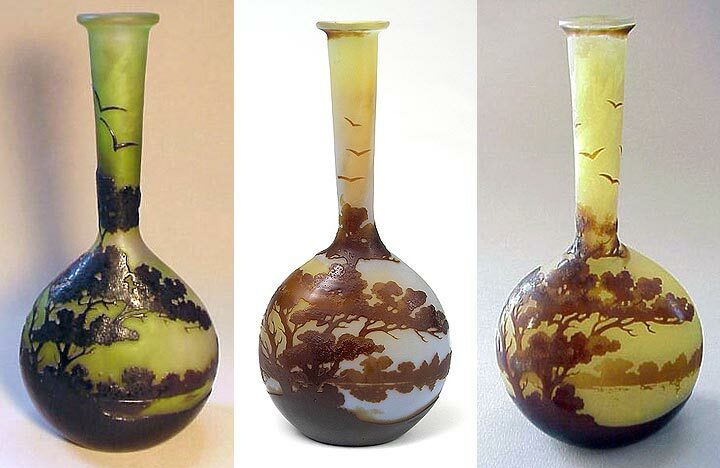 Even those vases were not identical because they were acid-etched after being mold-blown. Small differences occurred during the etching process. What I find most striking are not the minor differences, but rather the major similarities. There are so many similarities that it appears to me that perhaps the artists started with stencils and then used hand tools to refine the details, which make for the various differences. I can’t prove my hypothesis, but give me a better explanation and I’ll listen. Regardless, the total process of producing a quality French cameo glass vase by Gallé, Daum or others was very time consuming. 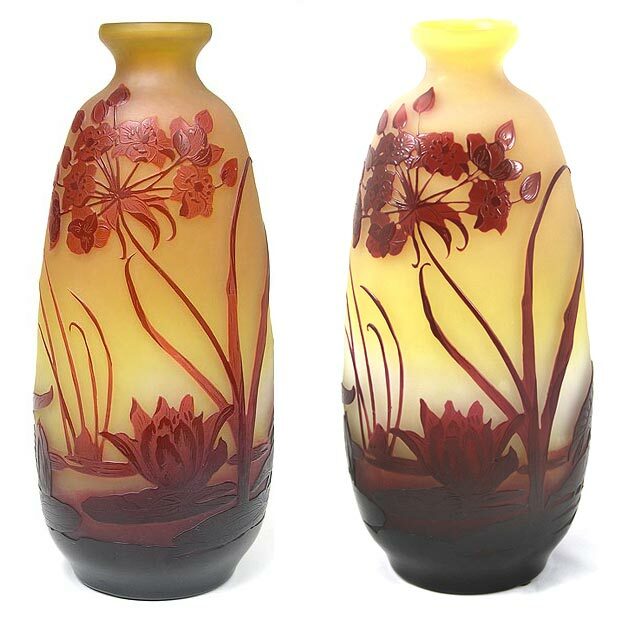 It required many steps and many hours to produce any vase and much more time to produce special vases. I’m very pleased with the continuing popularity of French cameo glass. The earliest French cameo glass vases, produced in the 1890s, are closing in on 125 years old. There are so many collecting areas that have fallen out of favor, that today’s popularity is a tribute to the French artists of yesteryear. 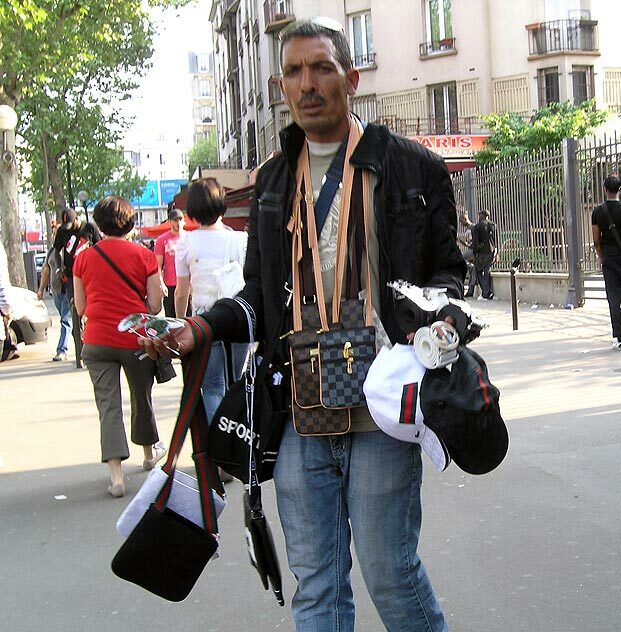 It’s hard to beat the quantity of antiques and antiques dealers in the Paris flea markets. There’s hardly anything French that you can’t buy, from junk for one euro to paintings for thousands of euros. Decorating your home? Whatever you can think of, you can find. 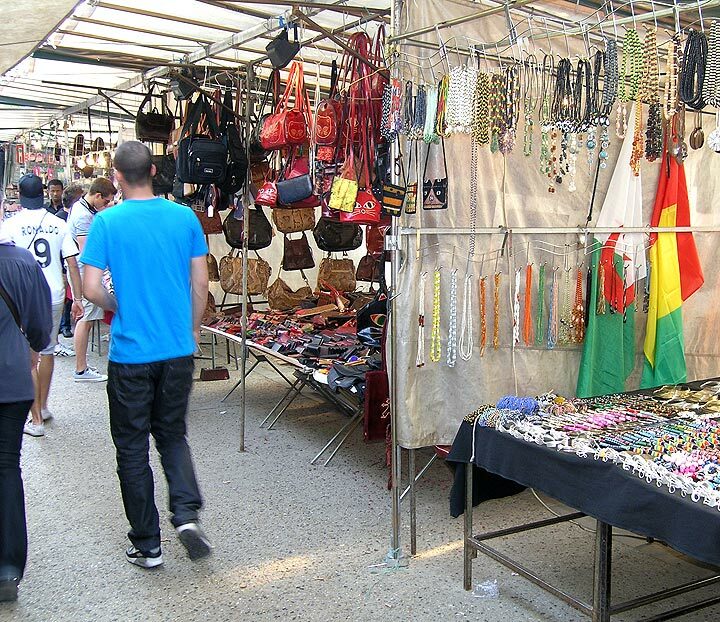 The flea markets, known as the Marché aux Puces (a puce is a flea), are located slightly to the north of Paris in an area called St. Ouen. You can get there by Metro if you take the 4 train to the last station, Port de Clignancourt. From there you walk north a few blocks, first passing the many street peddlers who look like they’re selling what fell off the last truck. Keep going and pass the regular flea market, where you can buy jeans, sneakers, tee shirts, all manner of tourist items and basically anything you find in flea markets everywhere. Continue another block and pass under the periphérique (the elevated road that encircles all of Paris). One more block to Rue des Rosiers and turn left. 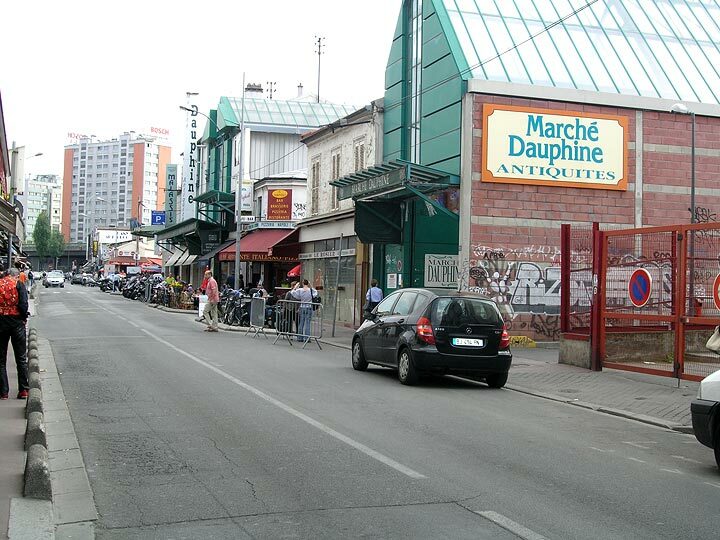 Rue des Rosiers is the main street of the antiques flea markets. There are many merchants with shops right on the street and hundreds and hundreds more in the various markets on the left and right and in the neighborhood. Some of the markets are more high-brow than others and some are distinctly low-brow. Give yourself lots of time to meander in and out of the many shops. 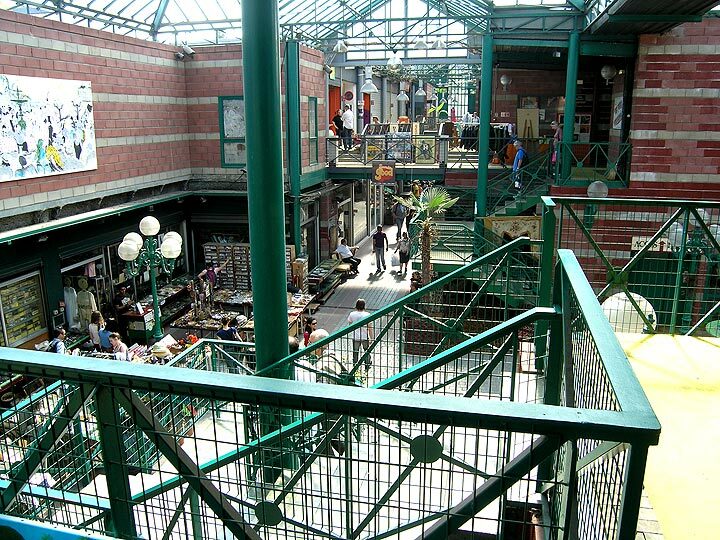 The antiques flea markets are open Saturday and Sunday, approximately 10 AM – 6 PM, with a few dealers open on Monday. 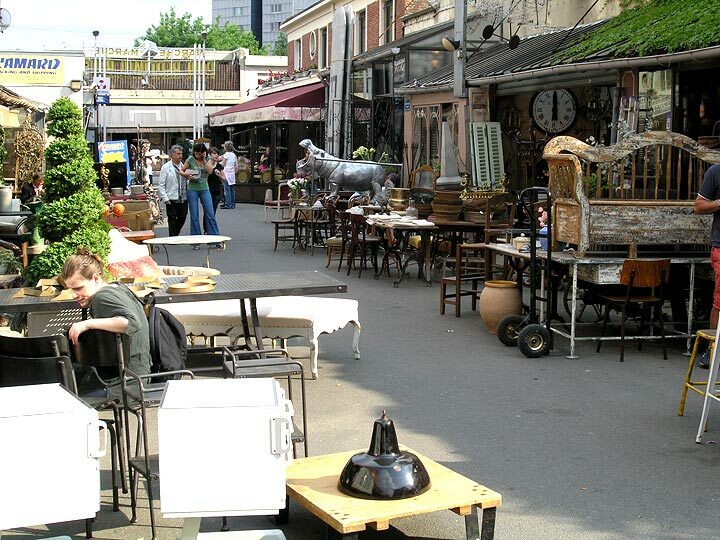 Some of the antiques markets are open very early on Friday morning. The regular general merchandise flea market is open Sunday only. The problem for Americans is the exchange rate. On our recent visit, the euro was hovering around $1.47, making it exceedingly difficult to buy. The prices on most items in euros were what I wanted to pay in dollars. We’re trying to buy at fair prices, so we can turn around and resell the items in the US. After pounding the pavement for several days at the flea markets and elsewhere, we did manage to buy a few items, but it wasn’t easy. We’ve developed excellent relationships with many of the merchants after shopping there for years, so that made our buying possible. On the other hand, collectors and decorators, not buying for resale, should have an easier time. On a working trip to Paris, the fun is in the evenings. We go to our favorite restaurants and usually have great food and wine. Sunday night was our last evening and I got it into my head that I wanted to have the best mussels and fries (moules et frites) in Paris. So we did a little research on the Internet and came up with La Cagouille. It was late, so before taking a 45-minute, 3-train ride to the restaurant, we asked the clerk at the front desk to call the restaurant to make sure they were open (until 10:30 PM). We made a reservation and off we went. By the time we got there, we had to rush because it was already 10:30 PM. We were worried we might not be seated, but luckily they had our reservation and seated us right away. The evening weather was perfect and we sat outdoors. Lovely! One of the girls brought out the board with the hand-written menu. Great, but where were the mussels? Guess what? No mussels. We called the restaurant, we rushed, we took three trains and no mussels. They claimed the season was just beginning and the mussels were too small. Excuse me, but that same day, the special at one of the restaurants by the flea market was mussels à la marinière. It was too late to go anywhere else, so we decided to make lemonade with our lemons. We ordered a nice bottle of Côtes du Rhône white wine, fried calamari with onions, a salad, skrie fish for Lia (on the recommendation of the waiter) and a different fish for me (also on the recommendation of the waiter). Out comes the wine (very nice), out comes the calamari (very nice). Out comes scallops for Lia and fish for me. I’m sorry, but we ordered a salad and two different fish dishes. I’m always amused by waiters who don’t write down the orders. Sometimes they have very good memories and get everything right. More often, they have terrible memories and get everything wrong. What’s up with that? Do they think they’ll look incompetent if they don’t write down the orders? Rather, they look foolish in getting the orders mixed up. But I digress. So Lia decided to keep her order. She likes scallops anyway and they looked nice. Did the waiter do anything about it? Absolutely nothing. In fact, he basically ignored us and paid lots of attention to a group at another table. Waiters make mistakes all the time. If the errors were serious, and this one was serious, they apologize and try to make things right by offering a free dessert, or drink, or making an adjustment to the bill. Nothing! Rien! Nada! So I was put in the awkward position of having to ask the waiter if it was customary to do nothing when a waiter makes a mistake. Oh, says the waiter? Would you like a cognac? No, thank you, how about dessert? You mean you want a free dessert? (Can I punch you in the nose for phrasing it that way?) Why, yes, I would (you dummy). So out comes a reluctant, but good chocolate cake. Was I right to be so upset with the waiter? Lia didn’t think so, but I know good service and this wasn’t it. Would I go to this restaurant again? Yes, I would. The food was good, but I would call in advance to make sure they had mussels. 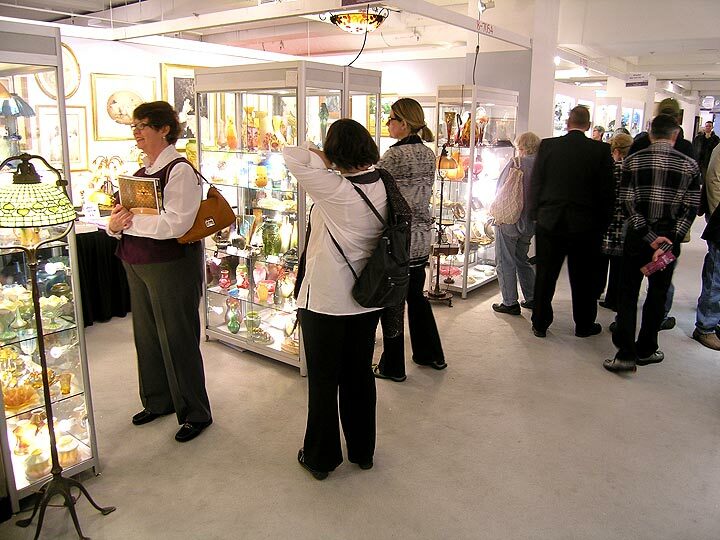 The Chicago Merchandise Mart International Antiques Show ended on Monday, May 2, 2011. Many of the dealers were pleased with their results, but a few were not. Following is some of the scuttlebutt. An important Art Nouveau dealer is not returning because he did not do enough business after having exhibited at the show twice. An important dealer of Art Nouveau, 19th century and Asian antiques only had a fair show, mainly because he sold Chinese antiques to Chinese dealers. (The Chinese market is red hot because of the new wealth in China. Chinese buyers are repatriating fine Chinese antiques.) A dealer in Russian antiques only had a decent show. A dealer in French furniture and bronzes did very well, exhibiting for the first time at the show. Another dealer who deals in general, but fine antiques, did very well. An important dealer in general, but fairly unique items, only had a fair show. Another who deals in mainly 19th century fine antiques and art only had a fair show. An English dealer of silver had a very good show. A domestic dealer of silver had a barely passable show. An English dealer of ceramics and other objects barely made expenses. (Last year was much better for them.) Finally several dealers in Asian antiques did well. 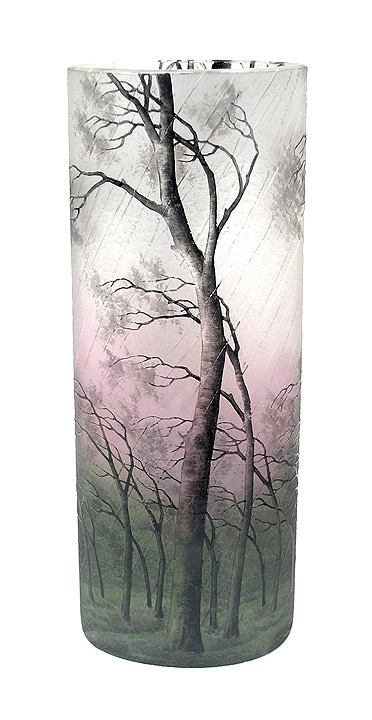 One of the fine sold Daum Nancy vases -- "Rain"
Personally, my show was very good. I have to thank all of my loyal clients, who made a point of visiting my booth and purchasing from me. 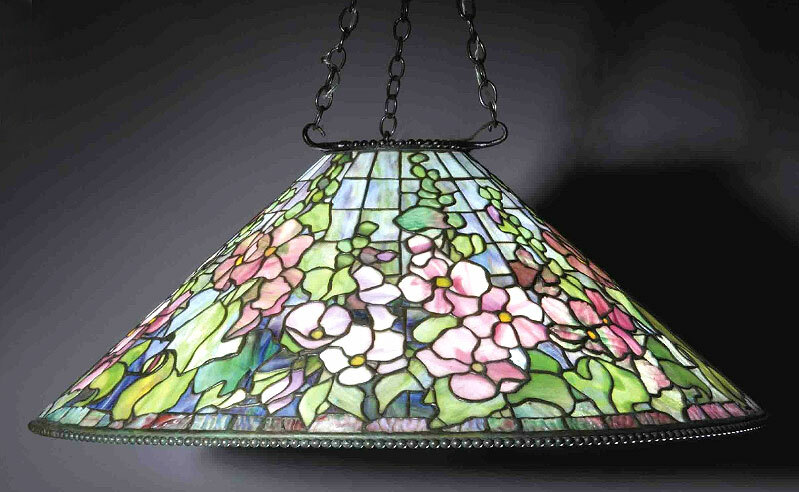 Interest and sales were best for Tiffany lamps and French glass by Gallé and Daum Nancy. I was disappointed that few of my sales were to new people, but thankful for the good show. So what was the consensus? Many dealers did OK, some did well, and others only had fair shows. I didn’t hear from a single dealer who had a great show. The best I heard was “pretty good”. Business was solid, but not ebullient. Overall, there have been better years, but almost every dealer is returning, with the exception of a few. So that means they think Chicago is a good city to exhibit and the Chicago Merchandise Mart is a good venue to exhibit. The Mart does a really fine job of making the dealers feel like they’re important. Kudos to the staff of the Merchandise Mart. I’m in the process of acquiring some wonderful Tiffany Studios lamps — a 7-light lily with beautiful shades and a fine patina, a 20″ Dragonfly and a 16″ Poinsettia. I should have them reasonably soon, so email me if you’re interested and I’ll send you photos as soon as they’re in my possession.